The Brigittini Servitores Sanctissimi Salvatoris Institute is a public association of the Catholic faithful in the Diocese of Tyler. We receive our spiritual care from the Saint Joseph the Worker parish. The parish church is staffed by priests of the Fraternity of Saint Peter. There is daily Tridentine Mass, public recitation of selected Hours of the Traditional. 1962 Divine Office in Latin and sacraments are administered according to the Extraordinary form. The Brigittini Servitores are in essence contemplatives, leading a life of prayer and sacrifice, a life strictly regulated by the Rule of life of the Brigittini Servitores. The mission of the Brigittini Servitores is to assist the Holy Father and bishops to implement the aims stated by Pope John Paul II in his 1988 Apostolic Letter Ecclesia Dei adflicta and by Pope Benedict XVI in his 2007 Apostolic Letter Summorum Pontificum, that is, to make the Extraordinary Form of the Roman Rite more accessible for Catholics. Our prayer life is centered on the Holy Sacrifice of the Mass and the Divine Office. We participate at Masses offered according to the 1962 typical edition of the Roman Missal and we pray the Roman Latin Breviary and Liber Usualis in force in 1962. The Divine Office is recited in full by the Brigittini Servitores. 1. Promoting the public recitation of the Divine Office by helping the Catholic faithful to appreciate and to recite it correctly and to promote its public recitation. 2. Promoting Latin literacy through seminars, formal courses of instruction, and correspondence courses. 3. Corresponding with priests, religious and laity interested in the traditional Latin liturgy and in the work of the Brigittini Servitores. 4. Disseminating information regarding churches, parishes and religious orders using the traditional Latin liturgy and other pertinent information for the promotion of same. 5. Organising and helping others to organise days of recollections and conferences for Catholics interested in the traditional Latin liturgy. 1. Time of the Holy Mass is usually different, i.e., it is later. 2. There is no work. Work periods are used either for private reading and prayers or scheduled group activities. The Servitores Reginae Apostolorum Institute, from which the Brigittini Servitores Institute has developed, was established in 1993 as an association adhering to the traditional Latin liturgy of the Catholic Church. 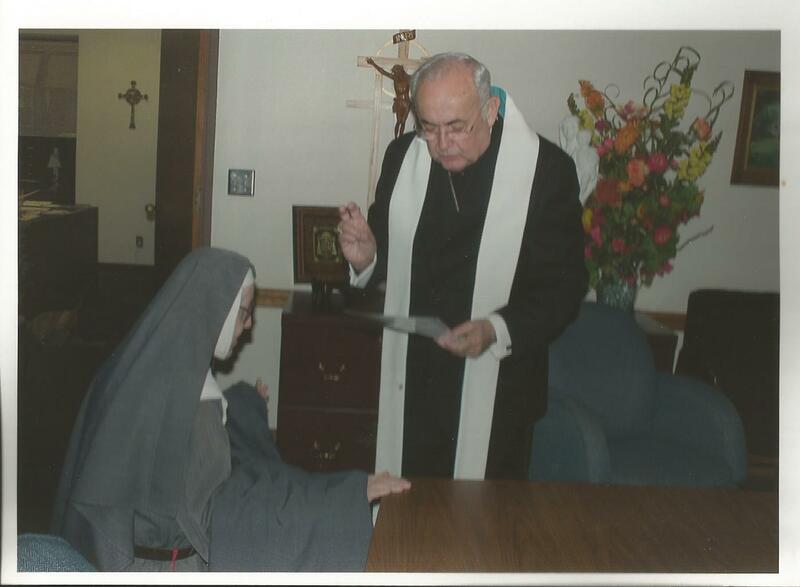 On August 31st 2011, His Excellency, the Most Reverend Álvaro Corrada – del Rio SJ, Bishop of the Diocese of Tyler TX issued the decree of erection of the Servitores Reginae Apostolorum Institute as a public association of the Catholic faithful. This was done after a careful scrutiny of our Constitution and Rules which lays down the guiding principles for religious life with the traditional Latin liturgy of the Catholic Church at its center and its promotion as its primary external mission. Such acceptance and support of groups following the Latin traditional liturgy became possible after the Apostolic Letter given Motu Proprio “Summorum Pontificum” of Pope Benedict XVI in 2007. 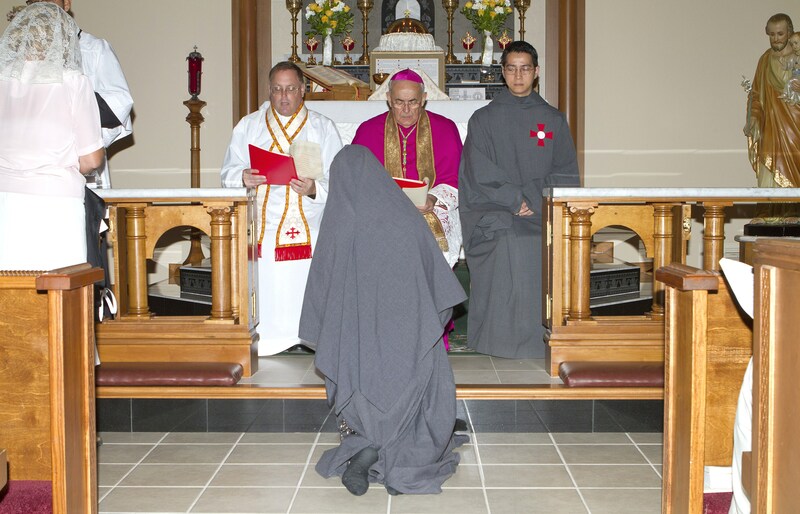 On June 10th 2012, our Bishop, Most Reverend Alvaro Corrada del Rio, SJ, put the Brigittine veil and crown on me. The other Brigittines were very welcoming towards the Brigittini Servitores. We are the only branch of the Brigittine family using the Latin Tridentine Mass and saying the liturgical prayers in Latin. In line with custom, many new foundations, such as the Servitores, sooner or later define their own spirituality and ally themselves with one of the existing religious families Embracing the spirituality of old standing religious orders which updated themselves after Vatican II without the updating is not an unknown phenomenon. There are Benedictine, Carmelite, Franciscan, and Redemptorist communities who are using the Latin traditional liturgy and continuing the traditional way of religious life. We began exploring the Brigittine path in 2003 when it was realised that there are many elements in the Servitores which are close to the Brigittine spirituality. We approached the Lady Abbess of the Brigittine Syon Abbey in England and received valuable help and guidance, including the very precious gift of the traditional Latin Brigittine Breviary. I was accepted as a Sister of the Chapter of Syon Abbey in 2004. We also contacted the Brigittine Brothers of Amity later on; they also gave us their support and encouragement. After the promulgation of Pope Benedict XVI’s 2007 Apostolic Letter given Motu Proprio “Summorum Pontificum,” it was considered feasible both by Lady Abbess and myself to work towards associating the Servitores with the Brigittine family, which has communities established in several countries and using for liturgical prayers the language appropriate for their country. Since then, adherence to Latin traditional liturgy became respectable and legitimate. In 2011 the Syon Abbey of the Brigittines in England closed its doors, essentially because of lack of new vocations. This abbey, established in 1415, survived the penal times of England during which it was in exile, two world wars and the post war social upheavals, but in a fashion similar to many other religious communities, has not done well in terms of attracting vocations in the wake of the changes imposed on their liturgy and way of life. However, the contact between the retired Lady Abbess and the Brigittini Servitores was and is continuing. We are also maintaining fairly close ties with the Brigittini Brothers in Amity, sharing information and praying for each other. It has now become customary to travel to Amity in July in order to be able the Feast of Saint Birgitta together. 4. HISTORY OF THE BRIGITTINE ORDER OF THE MOST HOLY SAVIOUR. Papal approval for the order was received in 1370, when Saint Birgitta was still living. The first Brigittine monastery in Vadstena was established in 1374, one year after the death of Saint Brigitta with Saint Catherine, Saint Birgitta’s daughter, was its first abbess. Magister Petrus, one of the two priests who lived a religious type of life in common with Saint Brigitta and Saint Catherine in Rome, became the first Confessor General, i.e. the head of the Brigittine monks. Saint Brigitta herself never lived in the Vadstena monastery. She resided in Rome from 1350 until her death in in 1373. The Rule and Constitution envisaged double monasteries. The Brigittine order included men as well. There was strong reliance on priestly support for the Sisters from priests embracing the same type of spirituality. The Brigittine priests did not undertake external missions, but they preached on Sundays and Feastdays at the monastery’s church. They also gave spiritual advice to visitors visiting the monastery. Originally, the Brigittine order included men as well. When residing in Rome, Saint Brigitta herself usually had more than one priest in residence. In the wake of the Reformation, the male branches dwindled away, whilst women’s communities weathered the storms a bit better. There were no efforts to re-establish double monasteries, consisting of Brigittine Brothers and Sisters. The attempts to re-establish the male branches of the Brigittines all came to naught, until the 1970s, when Brother Benedict Kirby founded the Brigittine Brothers in the USA. 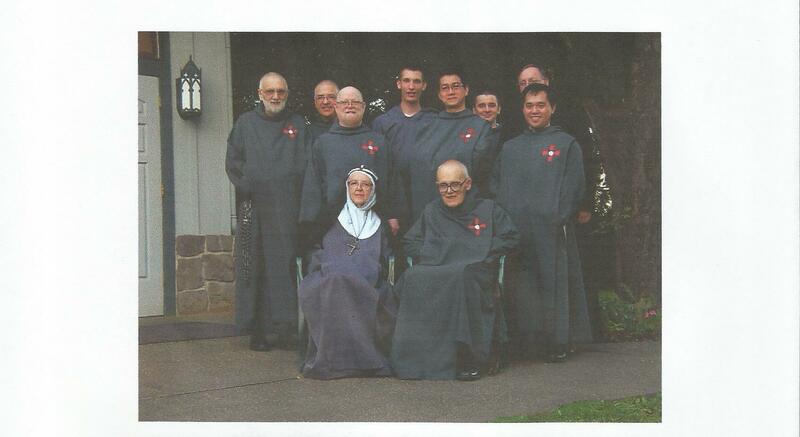 At the beginning, the Brigittine brothers had to move their home base several times, until finally they found their canonical home in Amity in the Archdiocese of Portland. Besides those communities of the Brigittine Sisters which remain purely contemplative, the Roman branch with an external apostolate came into being in the 20th century. This branch was born in the wake of Blessed Elisabeth Hesselblad’s successful efforts to reclaim Saint Birgitta’s original residence in Rome for the Brigittines. When double monasteries were still in existence, proximity of the Brigittine Brothers to the Sisters made a double Divine Office possible. The men recited or chanted the regular Divine of the diocese. The Sisters were present during it. At the conclusion of each Hour, the Sisters proceeded with the chanting or recitation of the Brigittine Divine Office. Adding to the regular Divine Office the Brigittine Office with its Marian orientation, it fleshed Office out, putting it under Our Lady’s mantle, so to speak. After the disappearance of Brigittine male branches the original pattern of double Divine Office came to an end. In the wake of the Council of Trent some of the surviving communities of the Sisters switched to the use of the Roman Divine Office. The use of the traditional Latin Brigittine Office survived (or rather, resurfaced again) in England until the latter part of the 20th century. During their exile from England, the Brigittine Sisters of Syon Abbey of England started using the Roman Divine Office. The community returned to England in 1861. In 1906 with the approval of the Bishop of Plymouth, Syon Abbey returned to the use of the original Brigittine Office and continued using it until the post-Vatican II liturgical reforms. By the 1970s all Brigittine communities were using the vernacular and either the updated, shortened and simplified Divine Office, commonly referred to as the “Liturgy of the Hours” or an updated an shortened version of the Brigittine Divine Office. At present, parts of the original Brigittine Office in Latin is still in uses by the Brigittini Servitores Sanctissimi Salvatoris. In addition to the recitation of the traditional Latin Roman Divine Office in full, we also recite the Brigittine ad Matutinum in full and add the Brigittine propers (parts other than the psalms) to the other seven Hours of the Roman Office. This became possible because the availability of the texts of the traditional Brigittine Office through the kindness of the Lady Abbess of Syon who provided us with copies of the traditional Brigittine Breviary in use by Syon Abbey until the late 1960s.